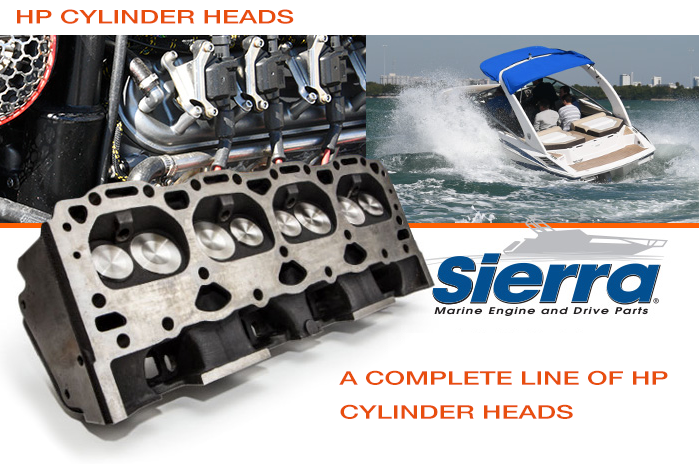 Sierra has a complete line of HP cylinder heads. These cast-iron cylinder heads are designed as direct bolt-on replacements. They feature a thicker deck for greater strength and superior port finish for increased horsepower. A 25 point quality check is performed on every cylinder head to ensure the best quality. Available for all popular GM small block and big-block applications. • and resistance to warping or cracking. • Hardened exhaust seats for compatability with all fuel types and ethanol levels. • Machined deck surfaces to promote proper head gasket sealing. • Three angle valve finish for superior air and exhaust flow. • Hand assembled for exacting fit and finish. • are designed to replace. • Available for all popular GM 4 cyl, V-6 and V-8 applications. 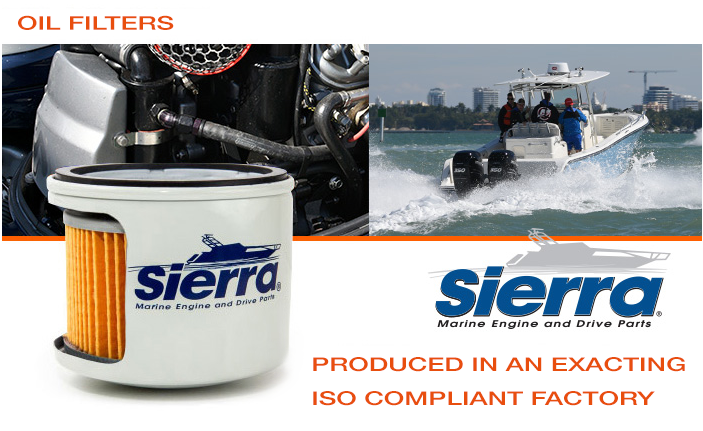 Sierra’s lineup of four stroke oil filters have been designed to meet the unique requirements of modern four-stroke recreational engines. Since recreational marine engines are used in extreme operational and environmental conditions; the properly designed oil filter is required for proper engine performance and longevity. • smallest outboard to the large diesel engines. • Complete lineup of generator oil filters to make servicing larger vessels a one-stop process. • Thick steel canister for added strength under fluctuating pressure conditions. • Wound steel tension spring to ensure the filter media’s sealing integrity. • Steel end caps to maintain media dimensional integrity over the filters service life. – protection and prevent oil starvation during use. • Wrapped center tube to provide additional media strength. • End cap and sealing ring designed to keep the filter properly mounted and sealed to the engine. – engine longevity and provide start up protection. • rising in OEM popularity and use. Sierra Timing Belts provide extended durability and smoother performance characteristics required by today’s marine engines. • Neoprene or Nitrile construction for maximum durability based on application. • Positive slip proof engagement. • Fiberglass tension member for excellent flex and elongation behavior. • Chemical and contaminant resistance for long life. • Meets or exceeds OEM belt specifications. • Modified curvilinear tooth or trapezoidal tooth profile for direct OE fitment/ replacement. • Recommended periodic maintenance interval of 5 years or 100 hours of use. • Inexpensive insurance to prevent catastrophic engine failure.